It’s a time of increasing opportunities for communication and interaction in the workplace. Technology has quickly demolished the need to be static, sitting at a single desk. If we choose to work mobile, we can. A higher degree of personal control over the way we work equates to 88% of workers feeling more highly engaged when they are not chained to a desk. However, great work still needs to happen in a physical workplace where colleagues can mix, influence, and affect each other in a way that has yet to be fully substituted by digital interaction. So what does this mean for workplace design? Well, the isolated cubicle and the ‘Matrix’ office is being ushered out, and the chance to do something markedly different is being welcomed in. The rhetoric about the open office, collaboration, and being ‘team-oriented’ is important for working culture, but more importantly, we are gaining the chance to consider our relationship to the environment in which we may spend a third of our daily lives. Think about it. Another third is spent in the bedroom, and we put plenty of effort into considering comfort for sleep. So why shouldn’t we optimise the way we work? Workplace design clearly needs to be a personal consideration. Think about a typical office workspace for X amount of people. There are desks, cabinets, partitions for individual focus, bulky office chairs for ‘comfort’, and divisions according to departments and skills. The salespeople sit in front, the programmers in a secluded corner, the execs in separate enclosures. Such a typical office is designed to separate and define in order to create islands of productivity. This worked to some degree in the age of paper and telephone, but in the real-time environment of co-workers fully connected by multiple digital strings, we need to promote something more expansive. Something that links us yet allows room to breathe. Being constantly switched on is tiresome, and we need to find ways to have constant access to our minds and thoughts so we can perform well at work. This means nurturing good energy flow in the workplace that promotes movement, conversation, pause for reflection, and that unfocused state of deep mental reverie that comes from standing in front of a Rothko. The workplace needs to inspire the full range of energetic flow we experience in a day (or night), so we can access the full range of our emotional states and find the inspiration for ideas. 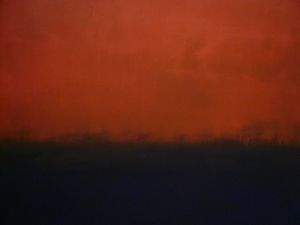 It needs to free our unconscious energies, as Rothko intended. Jackson Pollock, on the other hand, may contribute to a sense of heightened workplace agitation and stress, as one mental health journal discovered. The point is that art is a window to somewhere else, and that inspires a reassessment of one’s viewpoint. Creating good energy isn’t simply a matter of smiles and a positive mental attitude, it’s also the result of a workspace in which the occupants feel at personal ease to interact with one another and do their work themselves. And that means a space that respects however individuals need to work by giving them the option to collaborate or shut off. Besides, an office can feel positive with different emotional content. The cacophonous energy of excited debate charges the atmosphere, or the serene afternoon calm of focussed minds nurtures confidence. Both invoke a positive emotional energy within the space. The fact is, you can always choose how you wish to exude your own personal energy, but you have no control over the energy of others. This is why considered workplace design is so critical in laying the foundations for a successful environment that can channel the occupant energy in the most beneficial ways possible. It plans for the worst and expands the best. Thinking from an interior design perspective, we can look to integrate elements within the workspace that interact with the occupants. Imagine elements that naturally amplify the happy collective team energy of a successful work day, or in stressful times, design features that actively channel negative energy outwards and away. Illumination – Inadequate or inconsiderate lighting can create either over-illuminate a space and make it garish, or be so dim that it generates confusion and uncertainty. Ideally, appropriate siting of desks and furniture to respect natural window light leads to great flow. Workers don’t need to be sitting in direct sunlight, rather have visual access to its effects. Thematic Consistency – Workplaces can either opt for a branded interiors that reconnect workers with company mission and meaning at key junctures or can adopt an unbranded yet defined thematic design that weaves throughout to develop consistency. Retaining a specific flavour is simply less is more working its magic again. Acoustics – Or more specifically dealing with noise. Offices always generate chatter, and it distracts. A mix of open workstations and sheltered spaces incentivises worker migration towards areas that fit the moment. This can encourage formal interaction and meetings, or reduce feelings of overcrowding and help create refuge for solitary or intimate workflows. The option of escaping noise in comfort should always be considered within the interior design plan. View – Being indoors cannot mean the loss of one’s sensual interaction with the world. Looking away from each other or our screens, we need to expand our visual horizons to encounter the moments of reflection that inspire. Well-spaced artwork within functional areas is important. Imagine preparing coffee not in a dismal corner facing a wall, but in front of that Rothko or a window. Siting nexus points with views mean a connection with the environment and all its non-linear, organic visual benefits. For a concise overview of workplace planning for occupant health and wellbeing, see the HOK link here. All these measures contribute to the respect of the workplace occupants, for the bottom line that they cannot be corralled into a single way of working, but should be afforded the opportunity to find their own ways to engage with the interior environment and contribute happy, confident, and positive energy into space. They constitute part of a holistic approach to interior workplace design, one that signifies a huge improvement in the way we can choose to work. We need to create spaces that consider the energy of a place. This can be the original resident energy of a building or the infusion of new energy from new build and occupants. Either way, we need to treat our places of work as spaces that energise us. Maybe that extra touch is a Rothko for contemplation. 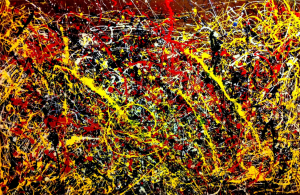 Perhaps it’s the Pollock for visceral energy. Either way, there are more cost-effective alternatives that will enhance workplace energy when approached with the right interior design perspective.